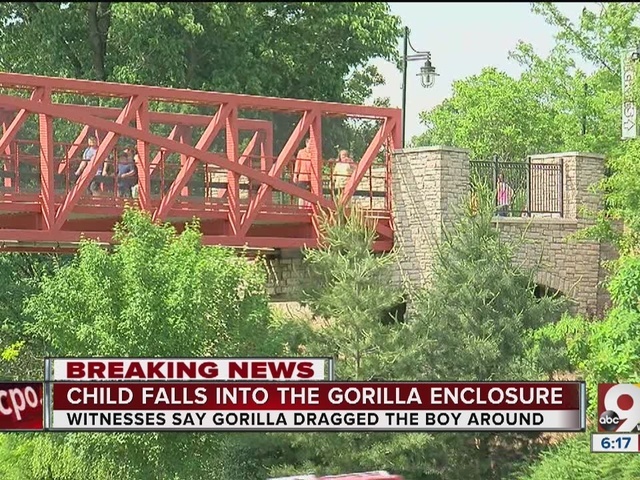 CINCINNATI – A gorilla was killed after it dragged a 3-year-old boy that fell into its enclosure at the Cincinnati Zoo & Botanical Garden Saturday, Zoo Director Thane Maynard said. The boy was hospitalized with injuries that were not life-threatening, police said. He was discharged the same day. 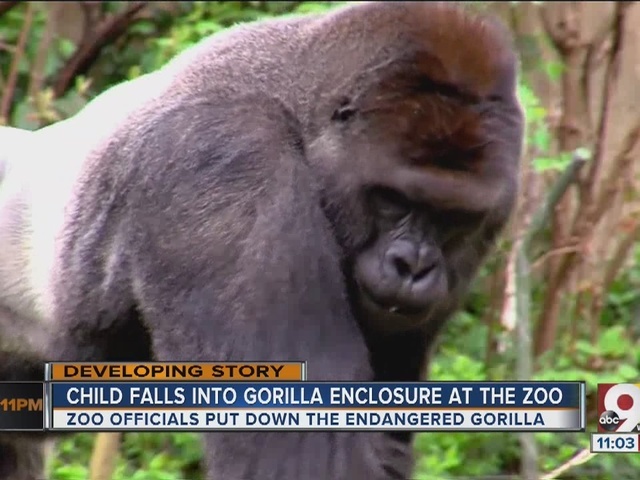 Police and EMTs were called to the zoo at about 4 p.m. for reports that a gorilla was "slamming the child into the wall." Maynard said the boy crawled through a barrier and landed in the moat. He was walking and splashing. Harambe, a 17-year-old male gorilla weighing more than 400 pounds, picked up the boy, Maynard said. Witnesses said the gorilla grabbed and dragged the screaming boy around the habitat for about 10 minutes. District Chief Marc Monahan said firefighters who responded saw the boy "dragged around and banged around pretty violently" by the gorilla. Personnel from the zoo's dangerous animal response team decided to put down Harambe rather than tranquilize him because the boy was in danger and the tranquilizer would not have taken effect immediately, Maynard said. Two other gorillas in the exhibit were called back inside. Maynard called it "a life-threatening situation" for the boy. The response team shot Harambe. "They made the right choice because they saved that little boy's life. It could have been very bad," Maynard said. "The decision was not made lightly; lowland gorillas are endangered animals." The boy was sitting upright calmly after the gorilla was shot, according to witnesses. He was rescued from the exhibit and hospitalized at Cincinnati Children's Hospital Medical Center for treatment of injuries that were not life-threatening, police said. The family released a statement Sunday that they were thankful for the boy's safety. 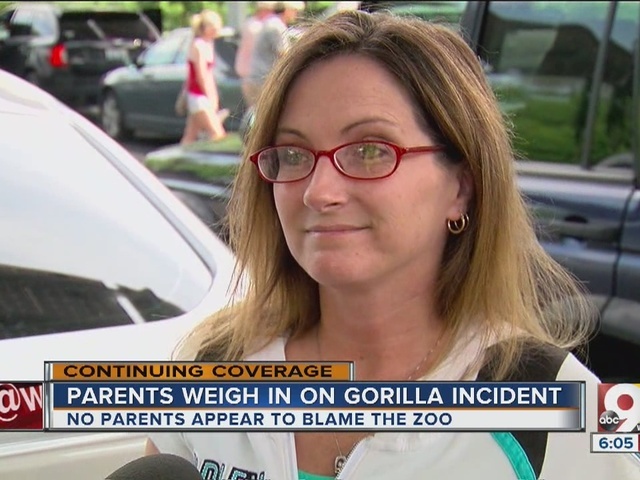 "We extend our heartfelt thanks for the quick action by the Cincinnati Zoo staff," they wrote. "We know that this was a very difficult decision for them, and that they are grieving the loss of their gorilla." Maynard expressed regret over Harambe's death. "Harambe was a good guy," Maynard said. "He was a youngster; the hope was to breed him." The "Gorilla World" exhibit is home to 11 gorillas in two family groups. The zoo has plans to expand the exhibit. Maynard said the exhibit was safe, and they have never had a problem with anybody getting past the array of steel wires before. The zoo has a long-running western lowland gorilla propagation program in conjunction with zoos across the country. Last year, a gorilla born at the zoo was the 50th born there. Harambe was born at a zoo in Texas. The zoo will be open Sunday, but Gorilla World will remain closed until further notice. 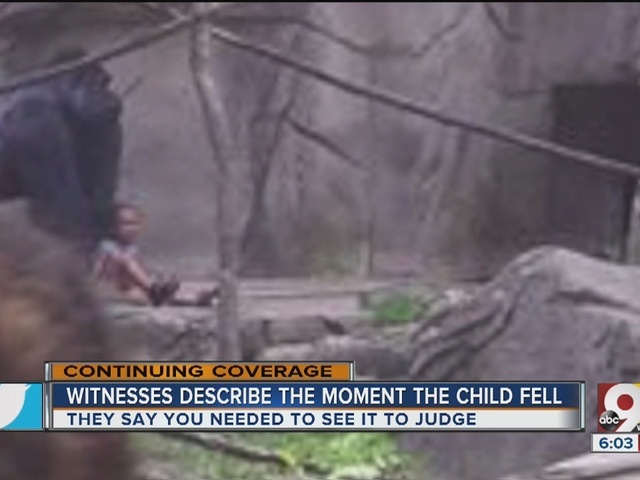 Note: WCPO is sharing video from Saturday's event at the zoo so readers and viewers can have an increasingly better understanding of the incident.